The number of athletes publicly proclaiming their faith has ballooned over the past 50 years through the establishment of sports ministry organizations such as Athletes in Action and Fellowship of Christian Athletes. These ministry organizations have made religious expression more socially acceptable in the locker room and on the playing field. According to former San Francisco 49ers and San Francisco Giants team chaplain Pat Richie, sports ministry organizations encourage athletes to publicly proclaim their Christianity. Since sports ministries became a major force in collegiate and professional sports they’ve had mixed success in creating religious sentiment both tolerant and respectful of Christian and non-Christian individuals. One notable example is Bill McCartney, who transformed the University of Colorado football team from a perennial cellar dweller to a vaunted national power between 1982 and 1994. Though McCartney guided the Buffaloes to a share of the 1990 national championship, his tenure was marred by scandals surrounding his evangelical Christian beliefs. Player complaints about McCartney coordinating religious activities forced administrators in 1985 to create a university policy outlawing coaches from organizing team prayers or Bible study sessions. In 1990, McCartney filled the 50,000-seat football stadium with members of his all male Promise Keepers ministry. Critics accused Promise Keepers of promoting a misogynistic agenda. In 1992, McCartney labeled homosexuality an “abomination against almighty God” from a university podium (he’s since apologized for his comments). When McCartney surfaced as a candidate for the position of Colorado’s head football coach a few weeks ago, professors sent protest letters to the university’s chancellor. The Washington Nationals were thrust into the center of the faith and sports debate in 2005 when a Washington Post article described how team chaplain Jon Moeller, who gathered the teams for prayer and distributed religious pamphlet, told one player that all Jews go to hell. Local rabbis seethed at Moeller’s statement and put pressure on team officials to discipline Moeller. While the Nationals’ attempt to promote religious expression proved a blunder, the Colorado Rockies managed to create a religious environment comfortable for Christians and non-Christians alike during the 2007 season. The previous season the Rockies had gained a reputation as an organization with a strong Christian culture after USA Today published an article describing the religious zeal of players and club executives. About 10 players on the Rockies’ 25-man active roster that season regularly attended Sunday chapel. The evangelical presence on the 2007 Rockies did not stifle or alienate other players. Jason Hirsh, a Jewish pitcher who was with the Rockies that season, said in a New York Times article that the Rockies’ religious players didn’t “impress it upon anybody”. 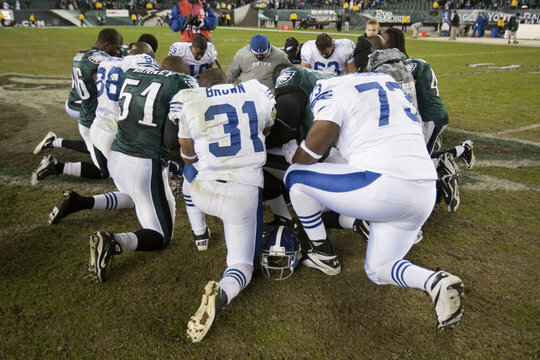 Professional football players have faced similar problems in their relationship with Christianity and football. Former NFL player Anthony Prior resents Christianity’s presence in professional football. According to Prior, Christianity is used as a vehicle to breed a culture of submission among players, particularly African-American players. Prior said that during training camp players in danger of getting cut carried around Bibles to impress management. Once players secured roster spots, they stopped carrying Bibles. Former tight end Esera Tuaolo said that during his season with the Jacksonville Jaguars there was a major rift between members of the Champions for Christ ministry and the rest of the team. Though Christianity’s presence on the athletic field has been met with mixed reactions, it seems primed to remain a major factor in high profile athletics. The massive presence of ministerial organizations on campuses combined with the presence of several high profile Christian athletes will continue to make Christianity popular among elite athletes. But the greatest challenge for these divinely inspired athletes will be creating a tolerant environment for players of all religious practices and levels of faith.